I imagined a heavy satin number or a crinkled polyester with a train. Was I ever wrong! 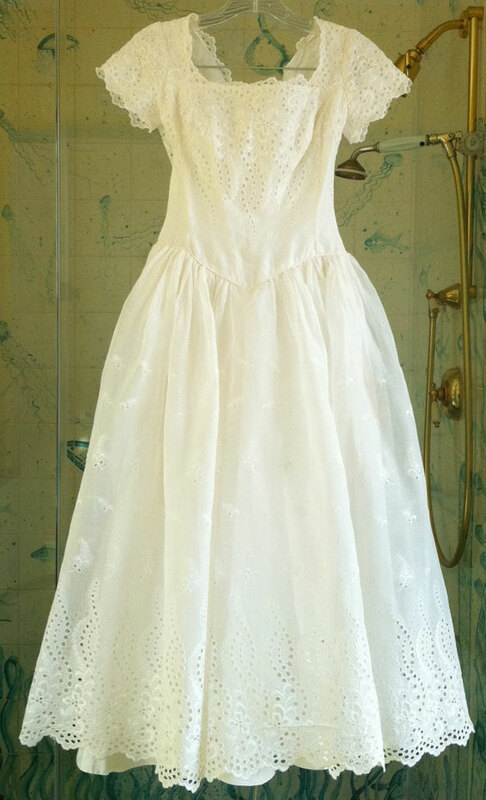 It was a tea length embroidered eyelet cotton and it was really charming. It had discolored from storage and the shoulders were spotted with rust. After confirming that it would be okay if I accidentally ruined it, I offered to launder it for our friend. I was hoping to salvage it but could not predict the outcome. Sometimes items do not survive being soaked and sometimes they don’t survive being ironed! I rue the fact that I didn’t snap a photo of it before I plopped it into the bathtub. Just after I started soaking the dress. At this point, I was convinced that the dress would turn out to be ivory instead of white. After 3 or 4 hours, the shoulders still had rust spots so I drained the tub and started over. The second soaking performed a miraculous feat: all stains disappeared. Even better, the dress emerged intact and strong. Drip drip dry from the showerhead; then it spent a few hours hanging from a hanger in the windy April sunshine. I ironed the cheesecloth underskirt, the acetate skirt and the outer cotton layer separately; it’s beautiful. The outcome of the dress; fit for the sugarplum fairy or for my friend's wedding!! 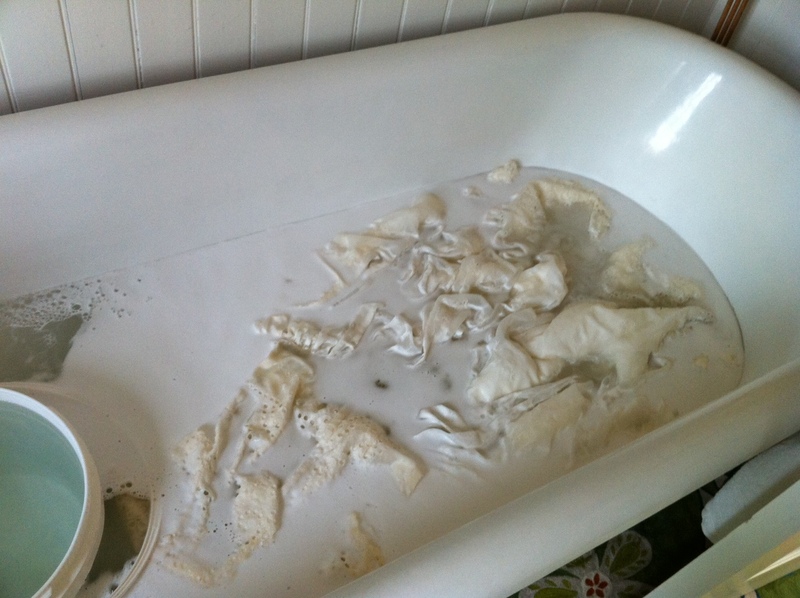 This entry was posted on April 5, 2011 at 11:48 am and is filed under caring for antique linens. You can follow any responses to this entry through the RSS 2.0 feed. You can leave a response, or trackback from your own site. Beautiful results. What did you soak the dress in and how long did it soak the first and second time? ?